On Saturday(May 19th) Busy Philipps attended the 7th Annual Norma Jean Gala at the Uplift Family Services at Hollygrove Campus, Vine & Waring in Hollywood, CA. 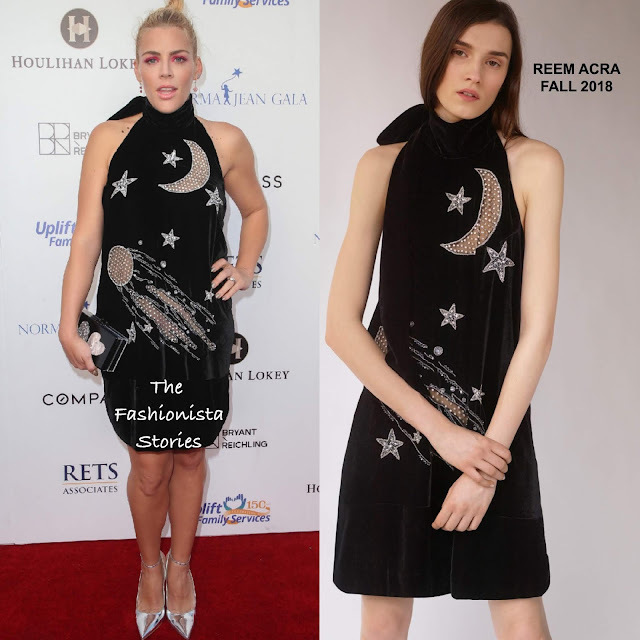 Rocking a cosmic inspired piece, she wore a REEM ACRA FALL 2018 black velvet mini halter dress which was adorned with silver sequin stars & moons and a tie neck. While I do find this to be a bit to heavy for the season, I do like it. However her make-up, mainly the hot pink eyeshadow, is really bad. The pink lip was all she needed. IRENE NEUWIRTH jewelry, an EDIE PARKER clutch and STELLA LUNA metallic pumps finished up her look.